Rita Iortyom, a 300 level student of the Benue State University (BSU) in Makurdi, started work as a men’s barber while still in secondary school due to the inability of her relatives to meet her financial needs. How did you get into the business of cutting men’s hair? I started as a cashier at my uncle’s salon. I decided to learn how to cut hair instead of staying at the cashier’s desk. At first, the male barbers taught me for the fun of it; sometimes they even refused to teach me as they felt I would not utilise the training. They did not know I was serious until I practiced my skills on one of them. I have been in it for about five years. Actually, it was finance. I needed money to take care of myself because I was not living with my parents. They are in the village. How does it feel venturing into a field believed to be the preserve of the male folk? It is an amazing experience because I have come to know so much. I don’t think I would have been as popular as I am now without this job. Many journalists have come here to interview me. Do you feel intimidated by your male colleagues? Not at all. They can’t even intimidate me because I know the job. The confidence I exude when a male customer comes here for the first time makes them feel comfortable. Yes, it is. I plan to open my own barbing outfit before I graduate from the university. But that can only happen if I am able to save enough money. What are the major challenges you encounter on the job? I wouldn’t say there are challenges as such except for finance. I need enough money to start my own barbing salon. When you have handwork, but do not have funds to set up your own place, it becomes a challenge. Have you made any effort to secure a loan? I made some efforts which did not yield result. I am trying to save some money. 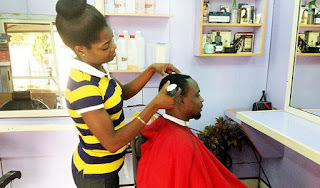 If I get a place of my own which will be a unisex salon, I will train more women in hair barbing and those who don’t do well there can work in the female hair dressing section. I have discovered that not many women can cut or style men’s hair. It’s my passion. I love what I am doing and will not abandon it even if I get a good paying job after graduation. I would rather invest in it because I know what I will gain by operating my own place. Do you think barbing business can pay you more than a white collar job? For me, I think it is more profitable than a white collar job because any business that one does and gets money on a daily basis is very good. If after extracting your expenses you can still realise N150,000 to N200,000 at the end of the month, then I will say it is a good deal. How do you combine your studies with the barbing business? Whenever school is in session, I pay attention to my studies and only return to work after classes. I don’t allow any of them to suffer; I have learnt to balance both of them. What is your advice to the youths? I advise youths to venture into profitable trades. Some young people think they cannot learn trades because they are graduates. But we have to start thinking outside the box. Do you think the government can play a part here? Yes. The government should invest in human resources because there are many youths out there with great ideas, but there is no money to transform their dreams into reality.